Do critics matter? Do people actually care about film reviews? These questions are almost as old as cinema itself, and they seem to get ask anew every couple of months, whenever a critically acclaimed movie flops or a critically drubbed one becomes a massive success. At least as bigger movies go, the conventional wisdom is that critics don’t really make an impact. Backed by enormous multimillion dollar marketing budgets and huge brand awareness, the studio’s tentpole releases are often considered critic-proof. 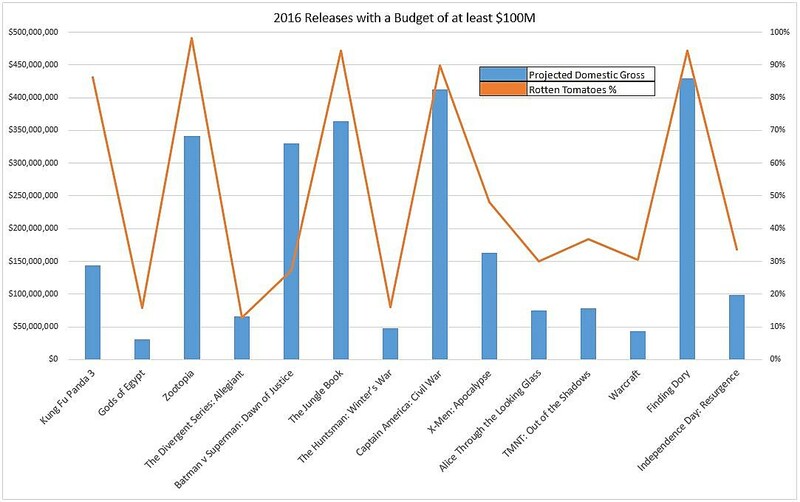 Supposedly it’s smaller, specialty releases that can benefit from (or be hurt by) film critics. But a user over at Reddit found an interesting correlation in 2016’s releases between domestic box office gross and Rotten Tomatoes scores. 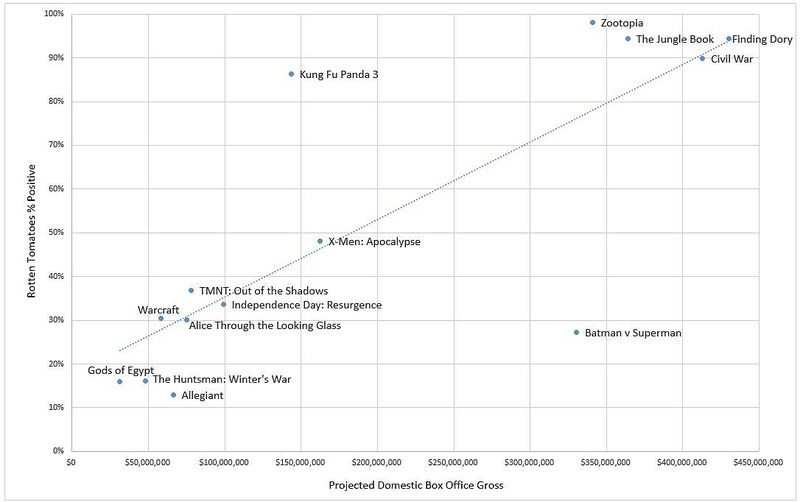 Of the 14 tentpoles included (all the movies of the year so far with budgets of $100 million or more), only two bucked the trend; Kung Fu Panda 3 (which got good reviews but failed to connect with broader audiences) and Batman v Superman: Dawn of Justice (which got shellacked by critics but still made almost $350 million in the U.S. alone. That one’s even more striking in that all the biggest hits are clustered together with great Rotten Tomatoes scores (except Batman v Superman) while all the flops are down at the bottom (except Kung Fu Panda 3). It would be interesting to see how much this rubric applied to the tentpoles of 2015, or 2005, or 1995, and to see whether it changes and how. Similarly, I’d love to see this approach applied to more of 2016’s movies. This is the biggest of the big; how does this apply to smaller releases? Do critics really help boost arthouse fare? Or is that a myth? Regardless, let’s remember this the next time someone on social media begins loudly proclaiming that critics don’t like anything, or a filmmaker who gets bad reviews declares they make something for paying customers rather than critics. It looks like critics and audiences agree more than you might think.